This also allows me to introduce my new, as yet anemic, Bibliography page, where I’ll be posting a list of stories, novels, etc and where they can be currently procured. No, not that time, though this period may cause stress, crankiness and discomfort as well… I’m talking about deadline time. Most anthologies, magazine and contests I’ve looked into set their deadlines at the end of the month. This isn’t necessarily universal or a rule, as I’ve a couple on my “to do” list which end in the middle of the month, but it’s common. Of course, everyone else puts their deadlines and due dates around this time as well. So, not only are you scrambling to finish two or three stories and send them off, but bills come due, demanding time with the old checkbook or online if you’re into that kind of thing, checking off a list of demands. I have found myself in this situation more times than I care to think about. What’s to be done? That’s a good question, and I’m experimenting right now with… ready? It’s actually not going very well right now, as procrastination has been a constant stalker in my life since I’ve had things I’ve needed to get done. Progress is, however, being made. More specifically, I’ve created for myself a schedule. (Ooooh!) I start with researching a handful of markets per month, looking for calls for submissions, themes, if you will, which appeal or even call to me. Basically, this allows me to set up a list of stories I need to write each month. These extra stories give me a buffer. I know I’m going procrastinate or get distracted by other projects or the dreaded Internet. I accept that, but I also know that if I see I have six stories to write, I’m much more likely to get three done than if I merely shoot for three. The initial mild pressure to do more, earlier, and since I’m keeping in mind that the others are stretch goals, it doesn’t hurt as much when I find I can’t do it all. This brings me to my next point. Having set a ridiculous goal, part of me wants to not just hit it, but knock it out of the proverbial park. You give me the “that’s impossible!” speech and some part in the back of my mind says, “We should do that.” Doing something extraordinary, something someone else doesn’t think can be done, can be a big motivator. Even though one of my stories derailed a bit and is too big to fix by tomorrow, let alone edit properly by the deadline (which of course is compounded by Easter and other obligations this week/month end,) I have two first drafts for next month already set up. This may also be a function of “do the easy stuff first.” Which can be a good way to get through a project or set of projects. I know reaching ahead and doing something I know isn’t due until the end of next month makes me feel like I’m ahead of the game even if I’d bailed on the current goal. This may seem counter-productive, spending this month’s effort on next month’s work, but it puts me in a place where I feel more like I can do anything. For me, feeling like I’m putting the icing on the impossible cake is far more motivating and effective than feeling like I’m under the gun, struggling to make a deadline. So here I am, still in the early stages of experimenting with getting stories written early in the month and being prepared before the last few days, nibbling my already too-short fingernails. Currently I’m on track to send out three of the four stories I’d originally intended, but if I get lucky, there’s this other fourth story, a much shorter, simpler one which might make it out as well. This is part one simply because I am super busy and have never been one of those “It was so good, I couldn’t put it down” people. I read in small chunks, as life and work allow. So how is it so far? I had a little trouble getting into the first couple of chapters. Now, I have adjusted to our differences in style and am enjoying this tale of solar-system wide intrigue and politics. Action centers on a penal colony orbiting Jupiter. We learn about the warden, the ‘secret’ prisoner at Minotaur and follow a number of flashbacks that define these and other characters. These deeper characters are flawed, haunted and I can’t wait to see how they impact the overall storyline. Check out the other reviews and comments on Amazon by clicking on the cover above and if you’re close enough, swing my the University of New Hampshire on Tuesday for a signing. I already have my signed copy, one of the first, and I look forward to finishing it during my more or less free week coming up. Find out more and reply to this event on Facebook. Or just show up to the UNH Bookstore 83 Main Street, Memorial Union Bldg. Durham, New Hampshire 03824 Tuesday, March 26, 11:00 – 14:00. As one might gather from my introduction to this subject, there is no such thing as SMF. Some editors require monospaced fonts like Courier. Others despise Courier so much, they refuse to read anything which looks like you tapped it up using an old school typewriter. Some want extra lines between paragraphs, single, double, 1.5 linespacing. Some need two spaces after a period, others, only one. Mysteriously in this day and age, perhaps to force you to make _really_ sure you want to send your story, some places still refuse to take email submissions. Some accept only certain file formats -which makes sense, as how much do you want to spend your time converting files across a bunch of arcane programs and risk not even being able to read the result due to translation issues? Or at the very least, scragging the formatting? What's the same? Generally, the one inch margins all around and... um... that's really it, that's the 'standard' guideline. The bottom line? Read the directions carefully. Read them again. Format your story, then go back and read the parameters again. If someone's particular about formatting -or anything else, really- it's their responsibility to tell you how they want it. Nowadays, there are many online guides. In my limited experience, rather than writing out their requirements, unless they're a bit out there, the editors will give you a link to which set of guidelines they prefer. If they order their steak well done, don't send the thing in bleeding. That's the surest way to get your manuscript back without being considered and without a hope of feedback, which is also known as the silver lining of rejection. “Practice makes permanent,” my Tae Kwon Do instructor used to say, “not perfect.” Nothing is perfect. He would often speak of masters spending their lives trying to perfect one form, one strike. While I think that leads us down the road of Jack Torrence in The Shining, (“All work and no play makes Jack a dull boy.” ad infinitum) there is a value to refining your technique rather than simply doing the same thing over and again in the exact same way. The primary way to do this is to have someone else read your work. Ideally, you can find a writers group in your area. With the growing popularity of NaNoWriMo and easy access to blogs and other outlets, more of us are coming out of the woodwork each year. People find themselves needing to express their feelings, thoughts and attitudes through words, and this gives you a great pool of readers from which to draw. There are also Facebook groups and websites devoted to writing which may yield readers. The advantage of having someone else read your work is that it can be difficult to see your own errors. You know what you’re trying to say in a sentence or paragraph, so your mind fills in the gaps. It’s what the mind does best, find patterns and extrapolate across gaps in data, just as it does with the blind spots everyone has in their vision due to the way the mammalian eye is formed. Another reader may pick out a word or phrase you’re not quite using correctly or sounds unnatural, or tell you when a sentence just doesn’t convey what you want it to or make sense to them. I often find that when another reader points out that there are a lot of passive sentences or some other issue, I suddenly see it, where I had read through that section a number of times. A fresh set of eyes is always helpful. You can also put a piece of work away for a few days or weeks to distance yourself from the expectation of what you should be seeing on each line, allowing you to edit your own work. This, however, maintains the solitude of the writer. If you enjoy this, then you miss out on other perspectives and valuable feedback, as well as being in danger of practicing a technique which doesn’t work and may be hard to break away from later. So go out and find some like-minded individuals, take some workshops, and make your writing a group event. Not only will it be more rewarding in the friendships you can build, but your work will improve! This week, I wanted to introduce a new section to the writing blog. This addresses another important part of writing: reading. To expose yourself to new ideas, recharge after spilling your imagination on to the keyboard and reenforce good writing, you should be reading. Personally, I’m reading through older sci-fi, in particular a book I picked up at the Salvation Army a year or two ago, but have finally gotten around to reading: Earthclan by David Brin. It’s actually two books in one volume, Startide Rising and The Uplift War. Both of these stories are set in a world of the future wherein humans have meddled with the genes of dolphins and chimps to ‘uplift’ them to human levels of intelligence and communication. In fact, the captain of the starship around which the story revolves is a dolphin, as are most of the crew. That in itself would provide a lot to work with, but there’s more, including a galaxy full of other star-faring races which have in turn been ‘uplifted’ by previous star-faring races in exchange for a time of servitude where they learn the structure of galactic society and find their place in it. I find the treatment of the psychology of dolphins vs humans and the interactions between them very well thought out. These aren’t just humans with flippers instead of arms and legs, but have their own culture, their own prejudices and affinities. I’m only partway through the first book, but will provide a more thorough review when I’m done. 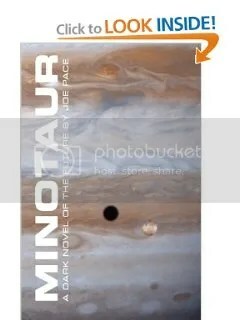 Next week, I’ll cover the other book I’m currently reading, Minotaur, by a friend of mine. Rejection has gotten a lot friendlier since I did this dance some years ago. I don’t have a strong personal sample, having sent out only two stories thus far this year and having one of them accepted(still feeling good about that, sue me.) I do however, have a tidy little stack of notes on company letterhead from Asimov’s and some other markets from years past. I was aiming high when I began, but I do plan to submit again to Asimov’s by the end of the year. I have three more stories in process for this month. I feel they can all be strong contenders, I just have to do the work. Until next time, keep writing!